The Sonoran Desert is one of the hottest places in North America for golf enthusiast. The great desert that spans to parts of California, Arizona, and the American-Mexican border. It is the home to trails of championship caliber golf courses. These courses feature some of the most unique and most challenging settings for golf games – both in layout and in scenery. These courses make use of the Sonoran Desert's natural rocky, dry desert terrain and the variety of rock formations of the desert to serve as natural hazards. Golfers who are used to Florida or California courses that abounds in water may find it refreshing that there is hardly any water hazard on any of these courses. But they are not to be taken lightly. The sun, the sand, and the unique desert vegetation will more or less keep the golfer busy and challenged. There are six courses that are part of the Sonoran Desert Golf Trail: The Golf Club at Eagle Mountain; the Sun Ridge Canyon Golf Club; the Desert Canyon Golf Club; the Cholla Course of the Wee-Ko-Pa Golf Club; the Saguaro Course of the Wee-Ko-Pa Golf Club; and the Vista Verde Golf Club. Golf World 2009 Reader's Poll ranked this course among America's Top 50. And not surprisingly so, this Scott Miller design makes good use of whatever nature has endowed the McDowell Mountains to its advantage. Surrounded by desert valleys, mountain peaks, rolling hills, and with elevation changes that can only be described as dramatic. This is where man's genius has worked in perfect collaboration with nature. Like the Golf Club at Eagle Mountain, Sun Ridge Canyon Golf Club brings out the best qualities of the desert where it belongs. It was carved out of its surrounding as if it were Mother Nature's hands itself that set it there. Water is abundant here, surprisingly, but so are desert arroyos. This course follow's nature's dictates, as are evident in the dramatic elevation changes. The Desert Canyon Golf Club was formerly known as the Fountain Hills Golf Club, and has a magnificent view of what makes its former namesake popular: the tallest fountain in the world. From almost every hole, the famous town centerpiece of Fountain Hills, AZ makes a splendid appearance. This could prove a refreshing delight in the hot desert, but could as well be a distraction. And the last thing anybody needs on a course like this is a distraction. 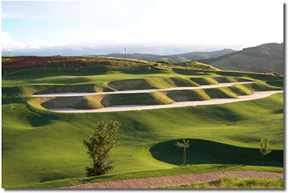 The tight, hilly layout will make any player's game – pro or otherwise – extremely challenging. This is one highly decorated golf course. This Scott Miller design has been voted by Sports Illustrated as one of the Top Ten New Courses in America when it opened. Apart from that, the Cholla Course of the Wee-Ko-Pa Golf Club has been named by the prestigious Zagat Survey as among America's Top Golf Courses, with accolades like Highest overall rating in Arizona, Highest value rating in Arizona, Top 50 courses nationally recognized for service. With an overachiever for an older sibling course, the Saguaro Course of the Wee-Ko-Pa Golf Club carried the burden of living up to the prestige that is the Cholla Course. But it did not disappoint. On the contrary, it delivered more than it was expected. More, in fact, that it was ranked by GOLF Magazine as among the Top Ten New Courses in America when it opened in 2007. It has all the same desert qualities that people enjoyed and savored at the Cholla Course. This is a joint creation of designers Ben Crenshaw and Bill Coore. Rio Verde, just outside of Scottsdale, in Arizona has a well-kept secret of a treasure. The discriminating golfers only know it too well. The Vista Verde Golf Club is the Ken Kavanaugh creation this side of the desert that has the sweetest of rolling terrains with lots of cacti for toppings. What makes this extremely special is the way the desert dominates the course – from elevation to hazards to the most sweeping views of the surrounding Four Peaks and Mazatzal Mountains. This is all the desert goodness served on the most complete golf vacation platter no golfer could ever resist. Amongst golfers, the truly enthused ones, this is not too much of a secret after all. 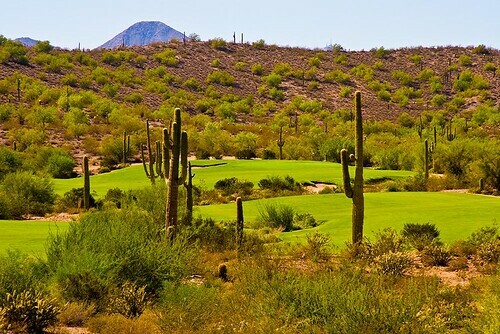 Contact our Golf Zoo Travel Specialist to book a vacation to Sonoran Desert Golf, in Arizona!! !